We do custom one-of-a-kind creations-from fireplaces to fountains! Outdoor kitchens for real “southern living” are a specialty. 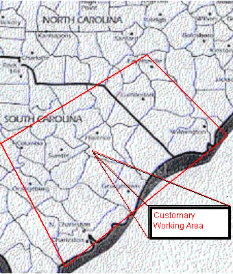 Centrally located in Murrells Inlet, SC, we work in areas from Wilmington, NC to Charleston, SC to Columbia, SC. Free estimates are done in the local area. Outlying areas may incur a charge for estimates, which will be credited to your account upon job acceptance. Jobs are individually created for private homeowners, contractors, and corporations. Homes – We can veneer homes with: brick, stucco, rock, stone, or block. We do home refacing, brick mailboxes, address signs, and masonry repairs (from driveways to chimneys). Concrete – from driveways and sidewalks, up the steps to your door!